Beautiful apartment on the “piano nobile” of Villa Schneiderf, built 14th/18th century is situated on a hill that surround Florence on the southern side toward Chianti 7 Km from the Ponte Vecchio. The apartment is a family home rather than a holiday let, full of contemporary art's works and consists of a luminous 90 sqm living , dining, and kitchen area with a spiral staircase that takes you to a mezzanine double bedroom and small bathroom. This living space has very high painted ceilings and enjoys breathtaking views of Florence. The main sleeping quarters are made up of two rooms, the first being a spacious 50 sqm through bedroom with decorated ceiling and beautiful views, leading to a second bedroom with a double bed and a small mezzanine on which there is a single bed. This beautiful apartment on the “piano nobile” of Villa Schneiderf, built between the14th and 18th century is situated on one of the hills to the south of Florence towards the Chianti wine and olive growing area,7 Kms from the Ponte Vecchio. The apartment is a family home, rather than a holiday let, both the house and garden are full of modern and contemporary works of art as the owner is an artist and collector. The apartment comprises three very spacious rooms, the first room the luminous 90 sqm living room, dining room, and kitchen area, has very high painted ceilings, a large fire place with a comfortable and cosy sitting area and and enjoys breathtaking views of Florence, a spiral staircase takes you to a mezzanine double bedroom and small bathroom. The main sleeping quarters are made up of two rooms, the first being a spacious 50 sqm room with vaulted, decorated ceilings, a divan bed and living area, above which is a mezzanine bedroom. This room leads to the bathroom area which consists of 2 bathrooms separated by the shower and with a large double Jacuzzi. The third room has a large double bed above which is a mezzanine with some single beds, from this 3rd room one also enters the bathroom area. A monumental staircase from the main living room takes you down to the private garden at the front of the villa where guests can watch the glorious sunsets over Florence while eating alfresco. Amenities: hot/stove, oven, fridge/freezer, microwave, dishwasher, iron/ironing board,cd player, TV, internet ADSL access. This quirky family home offers a haven of peace and tranquility. There are three spacious areas; the main 90 sq.m. Living room is open-plan: living/dining and kitchen area . this room was originally a music room, with 7mt high frescoed ceiling and ablaze with light from its large windows ,boasting sunsets and views of the Duomo .and the florentine 'skyline',a spiral staircase leads to a magical bedroom on a mezzanine above the kitchen, where you will find a double bed , shower and a bathroom in an old cupboard!. The Second area we call the Blue room which is a 50sqmt through room with a decorated ceiling and a cloud light ,stairs lead to a mezzanine on which there is a double bedroom and below which is an art installation of a 'house within a house' used as a study room or with an extra bed especially for kids. From the Blue room you have acess to the double bathroom with shower and also the North room. The North room has a double bed and stairs leading to a mezzanine on which are two single beds, from this North room you acess the bathroom with jacuzzi. .A monumental staircase from the main living room takes you down to the private garden at the front of the villa where guests can watch the glorious sunsets over Florence while eating alfresco. Garden lovers will find many interesting ,unusual plants and lots of work to get on with if they fancy ! Outdoors:Table and chairs, sunbeds, BBQ area with pizza oven & pingpong table. Private swimming pool. From the garden one may access the neoclassical style park, restored in the 18th century by Baron Schneiderf; for acclimatizing exotic plants to the Italian climate (cedar, african acacia, taxus, palms) and our vegetable patch. Description of the property: This beautiful apartment on the “piano nobile” of Villa Schneiderf, built between the14th and 18th century is situated on one of the hills that surround Florence on the southern side toward Chianti 7 Km from the Ponte Vecchio. The apartment is a family home rather than a holiday let and consists of a luminous 90 sqm living , dining, and kitchen area with a spiral staircase that takes you to a mezzanine double bedroom and small bathroom. 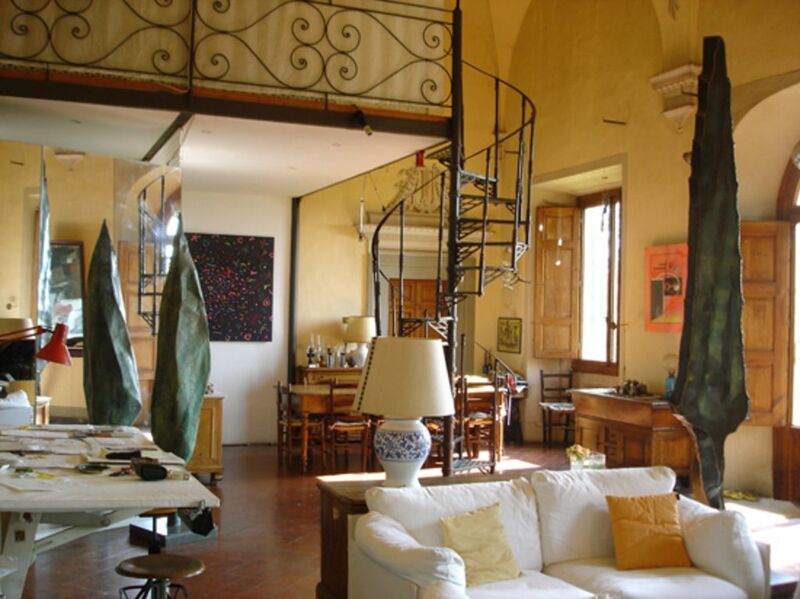 This living space has very high painted ceilings and enjoys breathtaking views of Florence. The main sleeping quarters are made up of two rooms, the first being a spacious 50 sqm through bedroom in mezanine with decorated ceiling and beautiful views, leading to a second bedroom with a double bed and a small mezzanine on which there is a single bed. The bathroom area consists of 2 bathrooms separated by a shower and a large double Jacuzzi . A monumental staircase from the main living room takes you down to the private garden at the front of the villa where guests can watch the glorious sunsets over Florence while eating alfresco. Amenities:hot/stove, oven, fridge/freezer, microwave, dishwasher, iron/ironing board, TV, telephone, internet access. Outdoors:Table and chairs, swimming pool, sunbeds, barbecue area with pizza oven & pingpong table. From the garden one may access the park of the villa .In the 18th century Baron Schneiderf restored the villa in the actual neoclassic style and being an illuminist he created a park for acclimatizing the exotic plants of the day to the Italian climate (cedar, african acacia, taxus, palms) Getting there: take the A1 “Autostrada del Sole” and exit at Firenze Sud, after the toll take the second exit towards Chianti and Pontassieve and at the 5th traffic lights at Rimaggio turn right up the hill for about 1 km. L'appartement occupe les salons d'un ancien manoir, et dispose d'un magnifique jardin avec vue sur l'ensemble de Florence. Les prestations sont très soignées et l'ensemble est aménagé avec beaucoup de goût. Les pièces sont très spacieuses et très propres. La literie est d'excellente qualité. La cuisine est très complète. Un potager a été mis à notre disposition et nous avons dégusté de très bonnes salades! Le propriétaire est un homme charmant, il parle français et a pris le temps de bavarder et donner des conseils. C'est un artiste, dont les oeuvres ornent appartement et jardin. Le centre de Florence est très simple d'accès, en 10 minutes en voiture. Nous y sommes restés 5 jours et n'avons pas pu tout voir. Envisageons d'y retourner, au même endroit! Très belle maison d'artiste, historique et une vue extraordinaire sur Florence. Du balcon ou du jardin, la vue nous a émerveillé du matin au soir, le ciel et l'ambiance changeant toute la journée. Riccardo et Alessandra ont été vraiment très accueillants, très prévenants mais aussi très discrets ce que nous avons appréciés (ils n'habitent pas sur le site). L'intérieur de la maison est atypique, des œuvres d'art partout et une ambiance si particulière : une impression très forte d'avoir beaucoup de chance de pouvoir profiter d'un tel lieu. Le rapport Qualité / Prix est incomparable. De plus, à seulement 7Km de l'entrée de Florence, la situation est idéale pour profiter des beautés de la ville tous les jours sans passer sa journée en voiture! Nous étions 6 amis et avons été tous séduits! Nous vous conseillons vivement cette location! Nous avons passé un excellent séjour dans ce très bel appartement d'artistes, remplis d’œuvres d'art avec une vue magnifique sur Florence. Riccardo et Alessandra nous ont réservé un excellent accueil, ils sont d'une extrême gentillesse et leurs conseils ont été précieux pour notre séjour. Nous recommandons cette location pour tous ceux qui veulent résider au calme à proximité immédiate de Florence dans un appartement extraordinaire. En dehors de la visite de Florence, de ses monuments et musées exceptionnels vous pourrez visiter le Chianti qui offre de très beaux paysages. Nous avons apprécié la pizzeria "Il Cigno" sur les rives de l'Arno à Florence, "Mac Dario" à Panzano in Chianti. Nous n'avons pas eu le temps de tester la trattoria "Gargotta" à deux pas de l'appartement (voir Tripadvisor). Un séjour formidable et inoubliable !!! La description et les photos de cette maison laissaient présager du meilleur, mais la réalité a été bien au-delà. Nos 2 semaines sur place ont été formidables, entre vie de château et vis de bohème, dans un cadre magnifique alliant respect d'un cadre exceptionnel chargé d'histoire, grands espaces à vivre, et audace artistique omniprésente. Et que dire de la vue exceptionnelle sur Florence que nous offre le jardin !! En fait, trouver les mots exacts pour décrire cette maison amène assez vite à utiliser des mots qui semblent outrés, et qui risquent de faire perdre toute crédibilité à ce commentaire... Et pourtant ! Cerise sur le gâteau, le propriétaire et sa femme sont des gens extrêmement prévenants et sympathiques, avec qui nous avons passé un très très bon moment. Visiter Florence et la Toscane sont l'occasion de vacances merveilleuses... Alors pour ne pas rompre le charme au moment de retourner dans vos quartiers, offrez vous LE pied-à-terre idéal (d'autant qu'au vu du cadre, le prix demandé est étonnamment peu élevé...). Een magnifieke eeuwenoude villa in de heuvels met de allure van een paleisje. De foto's doen amper recht aan de top-kwaliteit van het gebodene. De uiterst vriendelijke eigenaar is een Italiaanse beeldhouwer die zijn huis vol met eigen kunst heeft staan. Ook de dagelijks besproeide en dus uiterst groene tuin telt vele kunstwerken. En dat alles met een fantastisch zicht op Florence, vijf kilometer verderop. Een klein zwembadje (koud water!) maakt het compleet. Erg rustige omgeving. Er zijn bovenburen maar daar merk je totaal niets van. Het huis is comfortabel, smaakvol en luxe ingericht, met internet. De keuken is volledig ingericht. Met gemak kun je er met 6-8 personen in verblijven. In de tussenverdiepingen staan veel extra bedden. Het is 5 minuten rijden naar Florence (parkeer in de COOP halverwege en neem dan de bus). Volgend jaar willen we er zo weer heen. Nog nooit zo'n mooi vakantiehuis meegemaakt. Je waant je haast een filmster. En dat voor een alleszins redelijke prijs. We are situated on the southern hills with breathtaking views of Florence, 3kms from its outskirts and 7kms from the Ponte Vecchio. We are in the vicinity of the Chianti wine and oil area. In the hamlet of Rimaggio there is a classical music festival all year,there are also the possibilities to horse ride and to play golf ,and in the village of Bagno A Ripoli there are all the amenities. Ski: Getting there: take the A1 “Autostrada del Sole” and exit at Firenze Sud, after the toll take the second exit towards Chianti and Pontassieve and at the 4th traffic lights, at Rimaggio turn right up the hill for about 1 km, after the church on the curve turn left through the large gate with the Schneiderf coat of arms.